The wisest Jedi Master Yoda crashes through your wall shining the Force into your room and protecting you from the Darkside. Lit by green LED’s the whole of Yoda’s face illuminates glowing green to make a night light worthy of any Jedi in the making. Battery operated, there’s no trailing wires and so you can place Yoda wherever you please and with a twenty minute sleep timer function, Yoda will glow gently as young Padawans drift off to sleep. 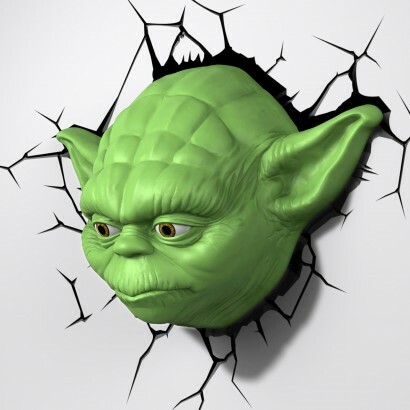 Place the crack backing sticker on your wall and hang Yoda over the top to create the incredible smash through special effect for an awesome light that will look equally as good in kid’s rooms, or in your man cave!